Whenever a production of Timon of Athens comes around, you should probably go see it. It is one of the least often mounted of Shakespeare's plays. Its status as one of the "problem plays" is upheld by the current staging at the Folger Theater, seen mid-run on Saturday night. This play, about a wealthy man brought low by his own prodigal generosity, is difficult to bring off, skirting the traditional qualities of both comedy and tragedy. Without excellent actors, it would be impossible. The Folger is blessed with two excellent performances, beginning with Ian Merrill Peakes in the title role. He was among the best parts of the Folger's production of another rarity, Henry VIII, in 2010. He was able to rivet attention again as a modern Timon, a high-tech mogul whose fear of germs and obsessive-compulsive behavior mean that he does not really connect with or even understand the false friends holding out their hands for his money. Timon has a beautiful mad speech ("I have a tree, which grows here in my close"), which is excerpted here throughout the second act, to show the character's mind unraveling. The best lines of the play come in Timon's confrontations with the cynical philosopher Apemantus, especially in the second act, played here with bitter delight by Eric Hissom. The two actors jousted happily as the characters traded barbs, the brutal honesty of the philosopher, the only character who speaks the truth to the wealthy Timon, repaid with derision. The rest of the cast seemed unremarkable for the most part, with the exception of the intense sympathy of Antoinette Robinson's Flavius, Timon's loyal steward. Robert Richmond, who also directed that Henry VIII mentioned above, has updated the action to our own time. Timon's house is a modern building, all neon lights, steel, and video screens: the sets by Tony Cisek wrap around the older beams and pillars of the theater. The only real negative is the use of painfully loud audio feedback sounds, an unnecessary reinforcement of the collapse of Timon's mind. Timon's flatterers receive their payouts on their smartphones, in the form of diamond-shaped icons reminiscent of virtual currencies like Bitcoin (projections by Francesca Talenti). Richmond, sensing the possible lulls in the action, tarts up many scenes with dance numbers and dumb shows, which reduce the subtle victimization of Timon to something too literal. Still it is the best sort of modernization, showing how relevant Shakespeare's words can be in our world of vapid gratification and one-percenter privilege. 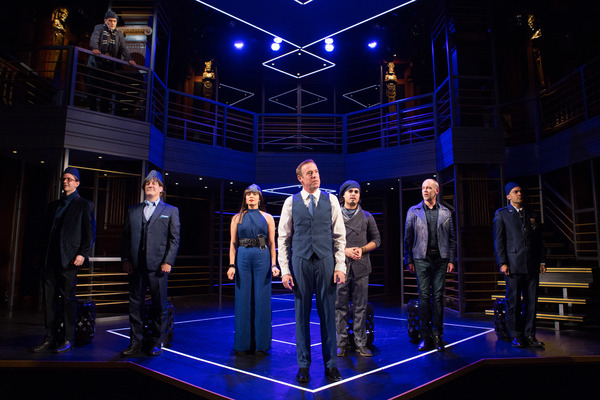 Timon of Athens runs through June 11 at the Folger Theater. I have to say I enjoyed it more than Macbeth which I saw the week before at the Harman.